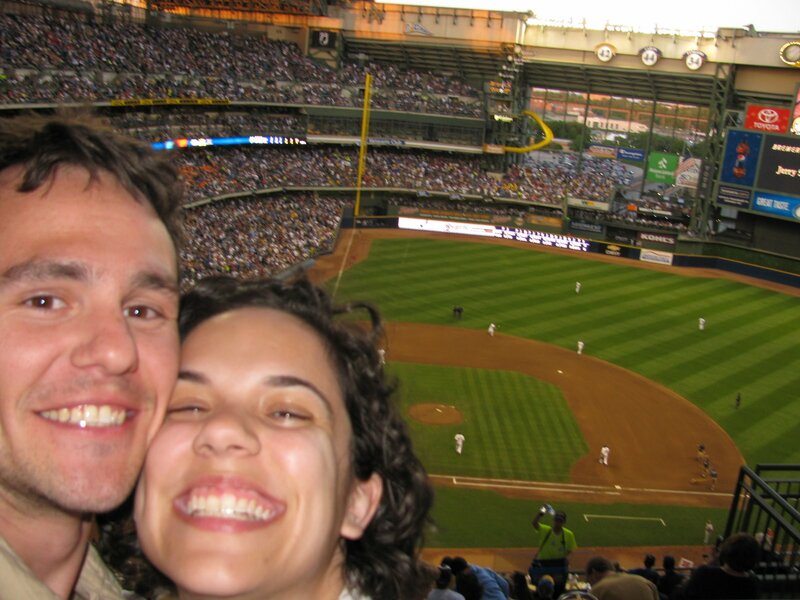 A series of planning errors/omissions on our part led us perfectly into experiencing a Brewers game as the locals do. As we circled for parking in downtown Milwaukee, we saw a corner full of frat-looking guys standing on a corner next to the chalkboard that read “FREE BREWERS SHUTTLE.” Being in our beer-seeking mindset, I first thought: “oh, a brewery event!” and then remembered, right, this town loves their beer so much that their baseball team is named for the concept. Perfect for our road trip theme. 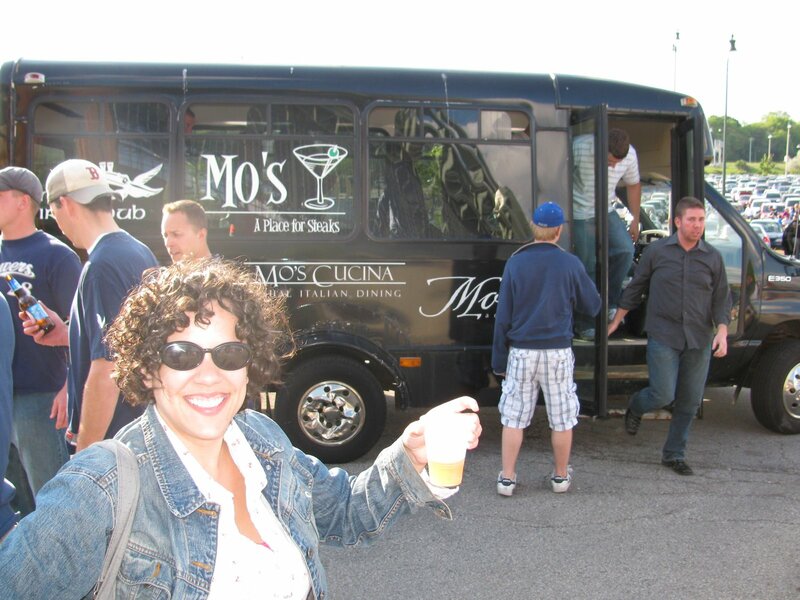 So, it turns out that Milwaukee wholeheartedly endorses tailgating and all that goes with it – barbecues and open containers. The stadium is named after the town beer – Miller Park, that is. And the naming opportunities don’t end there. This game turned out, more than anything else, to be an excellent lesson in sponsorship. We found our seats in the Kohl’s Family Section. That means lots of kids and no beers allowed. A nice break from the party bus, the parking lot, and the rest of the stadium. We watched as the Johnson Controls Grounds Crew tidied up the dirt between innings. For each double play, Dole donated $100 to breast cancer research. And one of my favorites, for each home team pitching change, a red Chevy Camaro drives across the warning track. Oh, but I should tell you about the game. Before we even reached our seats, the Reds had scored 3 runs. Yikes. As we sat down, the Brewers quickly matched that with 3 more of their own in the bottom of the 1st. The Reds scored another run in the 2nd, and another in the 4th. Things were not looking good for the home team. Then the 5th inning arrived. This is the kind of inning a home town waits for. The team finally responded to all the encouraged and advertised cheers, the flashing LCD screens and pre-recorded music. They hit two home runs, sending their mascot Bernie Brewer down the Kalahari Splash Zone Slide with barely enough time to climb the stairs back to the top. The team bats around, scoring a total of 6 runs. Ah, to be drinking your Miller (or one of its subsidiaries), wearing your Fielder jersey, and doing the Brakebush Chicken Dance and cheering for the Klement’s sausage of your choice. To live in Milwaukee in the summertime is to have no fear of taking your shirt off and waiving it over your head during the 8th inning Bad Dance Cam. Here, all 40,000+ fans will cheer for you and your beer gut displayed on the jumbotron. As the last 1/3 of the game goes off without incident, we pile into the parking lot, relishing in the 9-5 Brewers’ win. Surprisingly shivering, we watch shuttle bus after shuttle bus pick up their passengers, beer in hand, to take them back to the Irish Pub of their choice. Only back on our bus, did I get the full sense of how this town cared about the baseball as much as the stadium experience. In the game re-cap, I relished hearing the announcers signature home run announcement: “Get Up. Get Up. Get Outta Here. It’s Gone!” This was the piece of signage in the stadium no one had mentioned. It had been brought to us by The Game of Baseball.